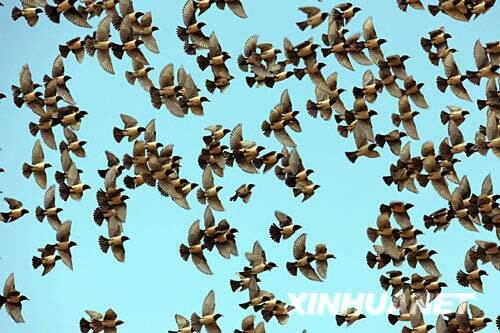 A battle between grasshoppers and rosy starlings is going on this summer on grasslands in northwest China's Xinjiang Uygur Autonomous Region. Rosy starling, a passerine bird feeding on grasshoppers, is under grade two national-level protection. They are now being used on grasslands as bio-pesticides to replace the traditional chemical ones. A rosy starling can eat some 120 to 180 grasshoppers per day. Together with chickens and ducks, the bird contributes a lot to their new habitat.